For high energy radiography and radioscopy of large objects, we usually use systems based on 2D scintillating screen and silicon intensified target (SIT) video camera. The SIT camera disadvantages and the imaging field size limitations (about 0.12 m2) leads us to develop a new system based on a high sensitivity CCD camera optically coupled to a large field (about 0.5 m2) Gd2O2S:Tb converter screen. In this communication, the design of the camera will be presented together with the constraints due to the large magnification factor required and to the sensitivity of the CCD camera to scattered radiation. The performance of the system will be illustrated on experimental results. This system has a field of view of 0.48m2 and a pixel pitch of 0.64mm. The geometric resolution obtained at 8MeV is close to 0.5 lp/mm and the sensitivity is close to 2% through 30cm of concrete. The maximum speed of acquisition is 9 images/sec. Application of this high energy camera in the field of nuclear waste are presented. Up to now, mainly Radiographic Image Intensifiers (IIR) and systems based on converter screen and silicon intensified target (SIT) video camera are used for high energy radiography and radioscopy. At energies higher than 500 keV, IIR present a strong lack of contrast and with converter screen system, SIT cameras are limited in geometrical resolution, their main advantage is to be insensitive to scattered radiation. Flat panel detectors in amorphous silicon are new comers in high energy and begin to be introduced in portal imaging on limited field of view. For examination of large objects such as Solid rocket motors or nuclear waste containers, large imaging fields (about 0.5 m2) are required with an acquisition rate of few images per second. In this paper, we present the design of the detection system together with the constraints due to the CCD camera integration. The performance of the system are illustrated on experimental results. Radiography generates a relative attenuation image of an object in order to analyse it. The X-Ray high energy stream, which came from the linear accelerator, is attenuated during its way across the object. The incident X-Rays are converted in electrons in a metallic intensifier before being transformed in visible light in the scintillator, usually Gd2O2S. These visible photons are collected to create the numerical radiographic image thanks to a CCD camera shielded by a lead wall. This image is a representation of the energy lost into the converter screen by the X-rays. A high sensitivity CCD cooled camera. Type of mount for C lens. It's necessary to frame entirely the converter screen in the CCD window to determine the magnification factor. This dimension is independent of the screen - CCD distance. If we consider the most conservative case (smallest side of the screen, greatest side of the CCD matrix), the magnification factor is equal to . The detection system is build around three elements (fig 2) : a screen converting X-Ray on visible photons and a CCD integrated matrix optically coupled by a lens. The optical calculation allows to determine the theoretical lens to be used and also to optimise the screen/CCD distance in order to move the camera away from the direct X-Ray stream. We finally choose a f17/0.95 lens. A dose meter probe has been placed in the detection system, in the camera location, in order to evaluate the radiation effect. The detector - X-Ray source distance is 3.7 meters, the conic collimator angle is 15° and a 11 mm lead glass is placed in front of the camera. The accelerator delivers 1750 rd/minute at 1 meter. The scattered radiation after attenuation trough 5 and 10 cm of lead is measured. The following table shows the experimental results. We don't detect any scattered radiation due to the transfer angle head. The experimental results shows that few centimetres of lead protection are required to shield the camera. The effect will be enhanced by adapting the conic collimation at the system and object geometry. In order to verify the previous theoretical measurements about the optical lens, magnification factor and camera position we performed a set of tests. These tests are carried out in a low level visible light (equivalent to the one obtained with an X-Ray stream and converter screen) with a dedicated Image Quality Indicator (IQI). We acquire the image with a 1 second acquisition rate to reduce the effect of the photon noise. Two modes have been tested : the binning 1 mode which gives a 1024 x 1024 pixel image, and the binning 2 mode (superpixel mode) which use 4 adjacent pixels to give a 512 x 640 pixel image. Finally, we obtain a real detectable image field of 770*650 mm and a sampling rate of 0.635 mm/pixel in binning 1 mode and 1.274 mm/pixel in binning 2 mode. First we estimated the physical limit of detection of the system by using the simulation software SINDBAD developed by LETI. On this kind of detector, an incident photon with a 2.5 Mev average energy, react upon the Gd2O2S :Tb (Gadox) to give an electron by Compton effect. The SINDBAD evaluation of the mean free path of this electron in 1.5 mm of Gadox shows that the spatial resolution limit is about 1mm (0.5 mm around the transmission axis). The spatial resolution of an image is measured in line per millimetres. In the case of high energy we evaluate it by measuring the cut off frequency for a step response to obtain the MTF of the system. In all the cases of measurement we reach values close to 0.5 lp/mm. We compute the contrast factor C by measuring the width evolution of a crack on the image. The formula C = (L - L0)/L, where L0 represent the mean grey level and L the maximum grey level of the crack, gives the contrast factor expressed in %. 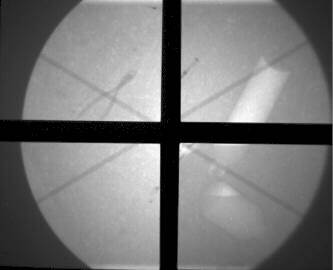 To do this, we put in front of the screen a set of lead calibrated cracks (from 0.53 to 5 mm) and acquire images in the full X-Ray stream or in a stream attenuated by 30 cm of concrete. The following charts (fig 2) shows the contrast evolution. The S/N ratio according to the exposure time (from 111 to 500 ms) has been measured in the area where the X-ray intensity is maximum. In this case the S/N ratio is basically the same . This measure gives the minimum exposure time to be used to obtain the best S/N ratio. For an X-Ray stream attenuated by 30 cm of concrete, the results shows that there is no evolution of the S/N ratio for an exposure time higher or equal to 1 second (fig 3). Then it is not necessary to work with an exposure time higher than 1 second. 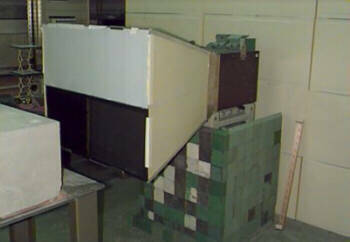 Preliminary experimentations have been performed before producing the large field screen. The large detector image has been reconstructed using quarter image (300X400 mm) and moving a small field screen. This allows to generate a large image without a large field converter screen. The following image (fig4) has been recomposed from a set of four quarter images. It represents a concrete bloc (dimensions 800x500 mm) which include some objects buried in 300 mm of concrete. This work shows the possibility to obtain an image with a large radiographic acquisition field (800x600 mm). These images are four time larger as those obtained with a current screen (300X400 mm) thanks to a 2D system of detection made up with a converter screen. The images we obtain are of good quality, even for a 111ms exposure time (camera acquisition rate : 9 images per second). Obviously, we have to extend this exposure time and to adapt it to the attenuation of the object we want to radiograph, so as to obtain an acceptable S/N ratio on the images. If we compare the characteristic measurements carried out using the large field screen with a reference small field screen, the results obtained are those expected as regards the spatial resolution and the dimensional aspects. The measurements of contrast, of detection ability, and of S/N ratio shows the potential utilisations of the system, concerning the detection of large objects such as large nuclear waste containers. From a practical point of view a feasibility mock-up has been designed. It represents the transfer angle part (fig 5). This part has been redesigned in order to define an industrial product which would be able to support a 600x800 mm sized converter screen. Authors would like to thanks ANDRA, CEA/DCC who have motivated and partly funded the development of the presented detection system.